Oakland’s Travis Bader hit a three with 13:42 remaining in the game to give the Grizzlies their first lead at 37-35, and they never looked back. 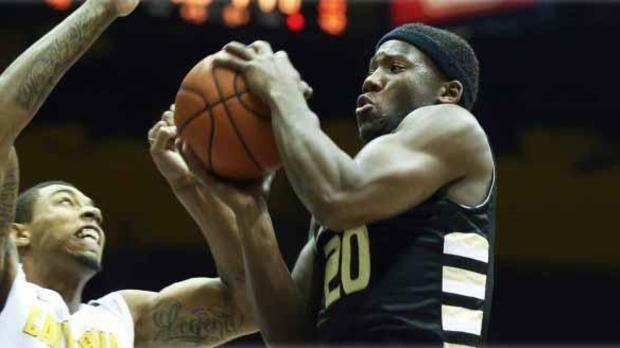 Oakland (2-7) defeated Ohio (6-2) Saturday, 73-56. Oakland closed the first half on a 15-6 run to tie the game at 25 at the break. The Grizzlies then outscored the Bobcats 48-31 in the second half to get their second victory of the season. “We just broke down. They had a huge stretch. (The lead) got to 10 and then we tried to get everything back in one possession,” said Ohio’s head coach Jim Christian on the Ohio IMG Sports Radio Network. Only six players scored for Oakland, but all of them had double digit point totals. The balanced attack was led by Providence transfer Duke Mondy (13 pts and 9 rbs) and freshman point guard Kahlil Felder (13 pts, 7 assists, and 5 rbs). Nick Kellogg led the Bobcats with 18 points. Jon Smith scored 10 points on 5/6 shooting and pulled down 9 rebounds on the night. Ohio’s leading rebounder, Maurice N’dour, also contributed with 12 points and 9 boards. Both teams shot poorly in the first half, but Ohio never trailed until midway through the second half, and the ‘Cats couldn’t regain the lead. Ohio shot just 37% from the field and went 3-24 from three. The game was tied at 37 with 13:13 to go, but Oakland then went on a 20-5 run over the next six minutes. Ohio never came closer than nine points for the remainder of the game. The Grizzlies closed the game on a 10-2 run to cap the 17 point victory. Ohio, a team that averages 10 turnovers a game, turned the ball over a season high 18 times. The Grizzlies forced 10 Bobcat turnovers in the first half alone. “This isn’t who we are. These are aberrations but they were awful. (…) We just need to get back in the gym and work,” said Christian. Ohio has suffered both of their losses this season on the road. The Bobcats return to action next Saturday when the host Alabama A & M at 2pm at the Convocation Center.